Beginning on May 22, after 5 months of steady open interest, someone shorted 3 million tons of wheat within 14 trading days. 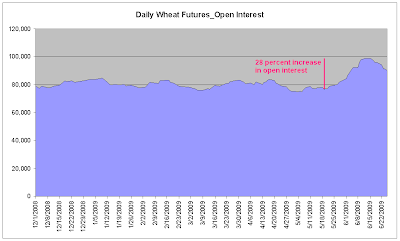 This rapidly built up short position increased open interest in the Kansas City Board of Trade wheat futures by 28 percent (22,000 contracts), as shown in the graphic below. This rise in open interest happened in the face of a powerful rally. Look at the graph below. Who in their right mind would aggressively short the market in the face of such rapidly rising prices? The shorting of 3 million tons of wheat coincided with the release of bearish USDA propaganda on global grain inventories. US and world wheat ending stocks are expected to increase in 2009/10, despite an assumed reduction in production, the US Department of Agriculture says. 1) Wheat ending stocks are NOT expected to increase in 2009/10 by anyone who has a clue what is going on in agriculture today. 2) "assumed reduction in production"? Try GUARRANTEED reduction in production. 3) This entire article is a desperate/dishonest attempt to portray bullish fundamental (looming food shortage) as bearish. This view contrasts to its projections for 09/10 coarse grain and cotton ending stocks which are expected to fall, the latest CBA Agri Insights reports. An assumed rebound in global oilseed production in 09/10 will result in oilseed ending stocks increasing from 08/09 levels, but they will remain at tight levels according to the USDA in its June 2009 World Agricultural Supply and Demand Estimates (WASDE). — European Union (-2.3mt) as result of lower yields in Hungary, Romania and Spain due to dryness. — Canada (-1mt) due to dry conditions in Alberta and Saskatchewan and cold conditions that delayed spring wheat plantings. — Ukraine (-1mt) due to dry conditions in April and May which cut yield potentials. However, crop potentials for 09/10 were revised higher for Russia (+1mt, due to an expected larger area and improved spring wheat crop prospects) and China (+0.5mt, due to a larger area). World wheat consumption estimates have been revised lower by nearly 1mt to 641mt, mainly due to reduced wheat feeding in Ukraine and the United States, and lower food use in Russia. But despite the downward revision, consumption in 09/10 will be a new record at 8mt more than 08/09 levels and 25mt more than 07/08 levels. Global wheat ending stocks for 09/10 were unexpectedly revised higher by 750kt to 182.7mt, the highest level for many years and well beyond the lows of 120mt in 07/08. Higher carry-in stocks and lower consumption estimates were the primary factors contributing to the higher stock levels. World wheat stock to use ratios are expected to climb to a comfortable 28.5pct in 09/10 [This is clear manipulation of data to suppress grain prices. It is propaganda], which is up slightly from the prior estimate and significantly higher than actual the 19pct lows in 07/08. A big increase in Russian stocks (+2.5mt), plus moderate increases in the United States and the "other countries" offsets lower ending stock estimates for the EU and Canada. My reaction: Alone, the 28 percent increase in KCBT open interest might be dismissed as producer "hedging", but, combined with the onslaught of inexplicably bearish releases from the USDA, it is clearly something more sinister. 1) Just as commodities were on the verge of breaking, someone came in quickly built up an enormous short position. Although I haven't researched other agricultural commodities or commodity options, I have no doubt they experienced a similar rise in open interest. Conclusion: This is clear evidence of wheat manipulation. What is worst, the USDA is obviously complicit in this effort to suppress commodity prices. Despite these manipulative efforts, nothing has changed. Droughts, under planting, and lack of credit have devastated global agriculture, and the world is still facing food shortages in 2009. This entry was posted in Food_Crisis, Market_Skepticism, News_Developments. Bookmark the permalink. Good post Eric, it does indeed answer somewhat to this video I posted in the previous post. If crops are really going to be down that much we may just be in for quite a surprise with all the cash standing on the line waiting to get back in the market when things brighten. At this moment, this cash can flow into anything and is seemingly dripping back into the general stock market, but should food supply really tighten it might change course and enter the food market. Wow, that's a rather bizarre story. I'm not specialist enough to have an opinion, but this could be major! Reposting message because link was breaking webpage layout. Although there probably is clear manipulation in wheat I would rather have manipulation than the brutal truth that may lead to world panic, economic disintergration and more people in the world going hungry. I don't think it makes sense to promote bad news about food supplies fact is there is f all we can do about it why stir a frenzy? Here is why it makes sense: Underpricing spurs overconsumption and encourages underproduction. Now the world is facing a food shortage this year no matter how much manipulation the US does. However, by keeping prices too low, the US is encouraging everyone to consume more and discouraging farmers producing more (they will cut back on fertilizer for example). This will make the eventual food shortage far worst than it would have been otherwise. The best thing would be if prices rose now. Farmers spend more money to grow more because of higher prices (better seeds, more land planted, more fertilizer, etc�), and the world would start cutting back on consumption. The eventual shortage would be less severe and last less long as a result. Less people would die (one sixth of the world is starving right now, and it will grow worse). Nothing of such kind has happened in any other agri-food market. ICE cotton, even had OI markedly down. But cotton's been a "commodity step-child" and a nightmare for years.. Wheat appears to be in a bottoming process, and KCBT has still more room to reach an important support level at 540 compared to what's happpening on CBOT. So I think someone has calculated that this support MUST be tested, and thus the new shorts. I guess there's enough evidence to pin down majors intervening in the gold market on behalf of the NY Fed. And I really feel sorry for Bernie Madoff who's in deep trouble just because HIS Ponzi scheme wasn't being SUBSIDIZED by US Govt, not like the majors who are naked-shorting gold & treasuries at will. And who are tose 'loonies' buying up high-cap stocks every Friday afternoon? Ain't they the same guys, hahaha? But you really have to come up with something MUCH BETTER if you want to show wheat futures manipulation. There is no shortage of wheat in the world, and you shouldn't expect it this year at least. BUT I think you are right USDA is talking the market down. Their S/D figures don't seem to be making much sense.